The Lehigh Township Historical Society maintains two historic sites which are open to the public. The Edgemont Park and Indian Trail Park are two other notable historic areas. ​click on the photo links below. 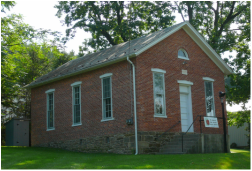 The Lehigh Township Historical Centre is a museum and houses memorabilia and other treasures of the past. It is also the location of our monthly society meetings. Come visit us during an Open House and explore the past. St. Paul's Schoolhouse, also a museum of sorts, was entrusted to the Society in 2007, with the understanding it would be restored and open to the public. We hold a special event and open house at the schoolhouse every year. ​Lehigh Township Parks - then and now. The word PARK, used as a noun, has several definitions. According to Merriam-Webster, a park is a tract of land that often includes lawns, woodland, and pasture attached to a country house and is used as a game preserve and for recreation. The Oxford Dictionary defines a park as a large public garden or area of land used for recreation and the Cambridge Dictionary says that a park in the US is an area of land for playing sports. Dictionary.com sums it up as an area of land, usually in a largely natural state for the enjoyment of the public, having facilities for rest and recreation, often owned, set apart, and managed by a city, state, or nation; or any area set aside for public recreation. By the time the 20th century rolled around, public parks across the United States had become a gathering place for people in towns and in the countryside. Entertainment was an important part of life in the early 20th century. People worked hard and looked forward to family time and a break from their labors with some type of recreation. In 1900 the population of Lehigh Township consisted of 582 families including approximately 2500 people. Many of the residents were farmers, while others worked in the slate quarries and factories or with the railroad. Church gatherings, family reunions, picnics, concerts and dances were favorite forms of family entertainment. It all began in 1902, when a trolley line called the Blue Ridge Traction Company was founded in Lehigh Township. The trolley line ran from Danielsville through Harpers and Berlinsville to Walnutport. Jay S. Moyer, the president of the company, owned a section of land along the trolley line near Harpers, midway between Berlinsville and Danielsville. Trolley companies commonly built parks at the end or along the line to attract riders on weekends. In 1904, the Moyers created a picnic area on their property along the trolley line in Harpers/Edgemont. A dancing pavilion, refreshment stand and entertainment stage were constructed in the park in addition to the picnic groves. The Morning Call newspaper reported that Edgemont Park held its grand opening on a Tuesday evening July 12, 1904 with a grand concert and dance. The Slatington Band furnished the music. The event was a great success with thousands of people from Lehigh Township and surrounding areas attending. In January 1909 the Moyers sold Edgemont Park to the Blue Ridge Traction Company. As the park's popularity grew, a swimming pool, children's play area and a baseball field were built. Churches, Sunday Schools and civic organizations gathered for picnics, families held reunions and young people from the area would meet there for a day of fun or an evening of dancing. At some point a casino and carousel were built and more amusement rides were eventually added to the park. Although Blue Ridge Traction Company ended its trolley service to Edgemont Park in 1924, it maintained ownership of the park until 1930. The park continued to operate under a variety of owners until 1965 at which time the rides were sold off and various park buildings were sold to different people. In the 1940s the park featured a restaurant and refreshment stand along Route 946. 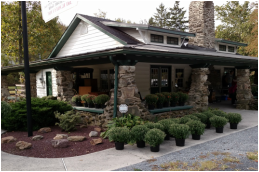 About 1946, stone arches, similar to those at Indian Trail Park's Trading Post, were added to the front of the restaurant building. The restaurant later became The Tavern which continued to operate until 2003. The Tavern building, with its familiar stone arches, was recently demolished, marking the end of an era. In 1929, the year before Edgemont Park was sold by the Blue Ridge Traction Company, Samuel and William Solliday purchased several acres of land along with a grist mill in Pennsville next to the Indian Creek. What began as a picnic area was developed into a new park. On May 31, 1929, The Morning Call described the Indian Trail Mill Park as "one of nature's ideal play grounds with a cement swimming pool with picnic tables, a fountain and plenty of shade." In 1929 the state completed a new concrete highway that ran from Bath to the Lehigh Gap. This highway provided easy access to the new park. When the park opened at the end of May its new cement bottom swimming pool was touted as one of the largest in Pennsylvania. Between the new road and the swimming pool the Sollidays constructed an unusual building with large stone arches and benches around the porch. Named the Trading Post, it housed a restaurant and soda fountain, and its main feature inside was an immense open fireplace made of stone. In addition to the swimming pool, the picnic groves attracted many families and other groups to the park. A Penny Arcade and concession stand offering snacks were also part of the park. A new dance pavilion held its grand opening on Saturday, August 10, 1929. During that era, dance halls were a very popular form of entertainment. This gave local residents a second location for dancing. Dances were held at Indian Trail Park on Tuesdays, Thursdays and Saturdays with music provided by popular dance bands such as Rau's Arcadians. The Morning Call reported that the first dance of the second season was held on May 3, 1930 at the Indian Trail Mill dance pavilion, with over 200 people in attendance. The old grist mill was converted into the Old Mill Dining Room over the next few years. One of the first rides was a carousel that was built over the creek that ran through the park. Other rides, including a roller coaster and train ride, were eventually added. Although the ownership changed a few times and parcels were sold separately, the park remained in operation. In 1939 the Trading Post and swimming pool were sold by the Sollidays to the Minnichs who operated both until 1945. Several ownership changes took place until the end of the 1970's when the park was sold at a sheriff's sale. 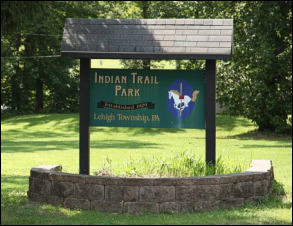 In 1978 the Lehigh Township Supervisors purchased the park from the bank along with additional land totaling 18 acres, and added the property to the township's recreation system. The park was resurrected by the Saullo brothers in the early 1980's under a lease agreement with the township. They filled in the pool and built a miniature golf course in that location, and added rides. The lease was terminated in 1984, by mutual agreement, due to the lack of profit. The park reverted to township operation to be used as a picnic ground, which is just how it began. Considering the various definitions of what a park is, the concept of a park in Lehigh Township has changed through the years. What began as a place for people to gather for picnics, dances and entertainment, and later on for amusement park rides, our parks evolved to what are now places for recreation, sports and to exercise. Baseball had become a very popular pastime and, as early as the 1930s, several baseball teams had formed throughout Lehigh Township. Teams from Treichlers and Danielsville played teams from Northampton, Slatington, Little Gap and Cementon. Because there was a baseball field in Danielsville, many games were played there. Baseball fields also existed at Edgemont Park and Indian Trail Park and, at some point, both parks had their own teams. Articles in the Morning Call have made references to a baseball field and park in Delps as far back as 1947. The exact location of that park is unknown. In March of 1959 a group of township residents made plans to organize and charter the Lehigh Township Athletic Association. LTAA began to organize youth sports and Little League baseball. In the 1960's the Tri-Clover baseball fields in Treichlers were built on land owned by Lehigh Township. LTAA is an independent organization that uses those fields. As Lehigh Township's population and interest in sports grew, more park areas were needed. In 1972, Raymond E. Bryfogle, a veteran realtor and longtime resident of Lehigh Township, left $142,000 to the Township and designated that the interest earned from the funds be administered by the Lehigh Township Lions Club for youth programs. Some of the funds were earmarked to build two tennis courts, and the Lions Club planned to erect a plaque and a gateway to the courts naming them the Raymond E. Bryfogle Memorial Park. In October 1975 the plans were for the courts to be constructed in Danielsville, but along the way that changed. In 1977-78 the township was working on the purchase of 20 acres of land in Berlinsville to build a park. Both projects took several years from the idea stage to completion. In the end, the new park at Berlinsville became the Bryfogle Memorial Park and included a ball field, 1/4 mile walking track, tennis courts and eventually basketball and volleyball courts. In August of 1980, Lehigh Township received grant money for sports and playfields at the Danielsville Park, including two tennis courts. In spring of 1981, plans to build the tennis courts and a basketball court at Danielsville were set in motion. A hundred years after the first park at Edgemont was created, further expansion of the recreation system in the township was needed, and in May 2003 a lease for 5 acres of land was approved in the Delps area. That project stalled for many years and, after a series of setbacks, the Delps Park was finally approved and contracts for construction were awarded in April 2016. This newest park consisting of 49 acres has soccer fields, a one mile and a 1/3 mile walking track, and is dog friendly. Old Hotels in the Township.